Sometimes I think I was supposed to be Italian. It’s a bit silly, really, since I don’t have a drop of Italian blood in me nor do I speak the language or, for that matter, have the metabolism to pack away a plate of pasta at every meal. Even so, I can’t come up with any other sensible explanation for why simply being in Italy makes me as happy as it does. In fact, no matter how long I’ve been away or how many other wonderful places I’ve been in the meantime, my reaction to Italy is always the same as the very first time I set foot there, when I fell so instantly and hopelessly in love with everything – the fertile technicolor landscapes, the jaw-dropping art and architecture and ruins, the exuberant, hot-blooded people, and of course the abundant, spectacular food – I was afraid my heart might beat right out of my chest. Still, I didn’t plan to tell you much about Abruzzo. You see, I couldn’t take the camera on this assignment, and anyway I was worried that I might already be flirting with Mediterranean overkill and that maybe, just maybe, you’re getting a little sick of all my rhapsodizing about olive trees, turquoise waters and oh-so-fresh seafood. No, I figured this time it would be better to just quietly sneak off, do my thing, and return a week or so later without you ever knowing I had been there. But that was before I almost hid in the departure-lounge bathroom to avoid having to board my return flight to Scotland. And it was before I willingly paid seventy-five euros in overweight fees to bring as many edible souvenirs as possible back with me. And it was before I arrived back home, dropped my bags and told Manuel that whether he likes it or not, someday we’re moving to Abruzzo, so by golly we’d better start learning some Italian. So you see, I’m just going to have to tell you a little about it. If you’ve never heard of Abruzzo, or are a little hazy on where on the boot it resides, don’t worry – I was too. In fact, I consider it a good thing that not too many people know, so do me a favor and don’t tell anyone else about this post, okay? That way it will stay nice and secret, just for us. Geographically Abruzzo is easy to pinpoint. Flanked on one side by mountains and on the other by sea, it sits directly across the peninsula from Lazio, the region surrounding Rome. In fact, western Abruzzo is barely an hour’s drive from Rome, but somehow it’s managed to stay invisible to the hordes of tourists making their north-south pilgrimages from Venice to Rome to the Amalfi Coast every year, a fact that I still can’t quite understand. Sure, for centuries its steep inland topography kept large parts of the region virtually cut off from the rest of the peninsula, but nowadays its perfectly preserved medieval towns, its rolling hillsides covered in vines, its largely undeveloped coastline, its soaring, snow-covered heights and above all its wildness – almost seventy percent of the region is protected natural parkland – should be bringing tourists in by the quadrillions. And as if all that weren’t enough, there’s the food. I ate better than I thought humanly possible on this trip – every meal seemed to be better than the last. It was rustic, gutsy stuff; Abruzzese cooks aren’t much for daring or imaginative, but they do all seem to have a quasi-religious fervor for simplicity, seasonality and most importantly, flavor hard-wired into them. One of my favorite meals, for example, included what was without a doubt the simplest, yet most perfect plate of pasta in tomato sauce I’d ever eaten: handmade quill-shaped ceppe pasta covered in sweet, blood-red tomatoes (bottled by the restaurant itself at their peak last summer, naturally) that had simmered for four hours with a meat bone or two, and served with only the lightest dusting of aged pecorino. There were also rich, deeply-flavored minestras; mountain lamb as soft and sweet as veal; salty pecorino and caciocavallo cheeses, grilled until crusty and drizzled with chestnut honey; dense, sweet sheep’s milk ricotta; bubbling pots of brodetto, the Adriatic’s pungent fish stew; light-as-air fried artichokes; chewy spaghetti alla chitarra and fresh ravioli scented with the dusky saffron from Navelli. What impressed me even more than the food itself, though, was the passion of the people producing it. In particular, I was struck by the sheer number of people I met who have dedicated their lives to preserving their regional culinary traditions. Among these were Silvio Sarra who thirty-five years ago founded a consortium to revive saffron production in Navelli, which after almost dying out a century ago is now considered one of the finest in the world; Luigi Di Lello who founded the Accademia della Ventricina, an organization that regulates, promotes and protects ventricina, southern Abruzzo’s ancient red pepper and fennel salami cured in pigs’ bladders (much better than it sounds, I assure you); Francesca di Nisio, the passionate young woman who reclaimed her family’s abandoned olive groves and now makes some of Abruzzo’s finest oil; and Manuela Cozzi, whose project I particularly loved. Manuela heads a cooperative in the mountain village of Anversa that seeks to preserve Abruzzo’s shepherding heritage, and she and her partner Nunzio both breed sheep and produce award-winning cheeses (including an incredible juniper-smoked ricotta). In a brilliant PR move, a couple of years ago Manuela decided to start offering up the cooperative’s sheep for ‘virtual adoption’, sending adoptive parents all the wool, pecorino and ricotta their ovine offspring produces in a year. It was a media sensation; in her thick file of articles are descriptions of her project in the New York Times, Washington Post and just about every major European newspaper. It’s no wonder people are interested; at $190, adoption is not only a steal, but a great opportunity to help preserve a dying way of life. Another food-crazy local resident I had the pleasure of meeting was a woman named Liz Franklin. Liz is an English cookbook author who fell in love with Abruzzo and moved there a few years ago to set up a small cooking school in the village of Orsogna. I got to spend a day and a night with her, talking about everything from her Masterchef win in 1996 (!) to how none of those ‘English-speaker-moves-to-Italy’ memoirs even begin to capture the real experience. And while we talked, she showed me how to cook some Abruzzese favorites, like arrosticini, little lamb kebabs grilled on a kind of long, narrow barbecue, and a garden’s worth of vegetables roasted until soft and smoky in a traditional wood-fired oven. The real star of the show, though, was her gelato. "I’ve developed this really easy technique," she told me, lowering her voice and looking furtively around. "I’m sure Italians would think it’s blasphemy, but everyone who’s tried it absolutely loves it." The technique is incredibly simple, in fact – just a quick blitz of mascarpone, milk and sugar – and like she promised, the results are stunning. We used it to make a straciatella, drizzling warm melted chocolate into the frozen cream as it churned, but I think it’s even better suited to fruit gelatos, where the substitution of mascarpone for egg yolks as a stabilizer really lets the fruit flavors shine through. This strawberry-balsamic version, in fact, is probably the best fruit gelato I’ve ever made – tangy and intense, with just enough richness to satisfy. It’s unbelievably quick and easy too, which is great when you don’t want to waste a beautiful summer afternoon in the kitchen, or when, like me, you’ve got several dozen Italian verb conjugations to learn before dinner. This easy-peasy method can be used to make gelato* of just about any flavor, though it’s particularly suited to fruit. Liz’s base mixture, which you can adapt to any fruit you like, is 1 cup each mascarpone and milk (that’s 250 grams/ml), and 1/2 cup (100 grams) sugar. How much fruit you add to that is up to you – my suggestion would somewhere in the range of 1-2 lbs (500g-1kg), depending on the fruit. Some fruits might not need any more sugar, but most probably will – your tastebuds are your best guide to that. Just make sure you macerate any fruit for a good hour before combining it with the dairy, and of course, please, please, please use the ripest, most flavorful fruit you can find. *For more background on gelato and what makes it different from other ices, have a look at this old post. Wash, hull and quarter the strawberries. Combine them in a large nonreactive bowl with the sugar and balsamic vinegar and macerate at room temperature for at least 1 hour. In a food processor combine the strawberries and their liquid with the mascarpone and milk and process until smooth. If you prefer a chunkier texture, strain out some of the berries before processing and stir them in afterwards. Process the mixture in your ice cream maker according to manufacturer’s instructions. 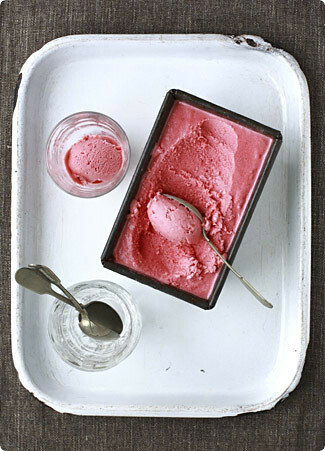 If you don’t have an ice cream maker, David Lebovitz has some great tips here on making ice cream without a machine. Like all homemade ice creams, this is best the same day it’s made. If you don’t mind an icier texture, though, you can keep it a week or so in the freezer – just soften it in the fridge for twenty minutes or so before attempting to scoop. p.s. Nicky and I are obviously on the same wavelength at the moment – check out her luscious-looking strawberry and balsamic ice cream! p.p.s. And as long as we’re speaking about Italy, I should let you know that my piece on Calabria is now out in the June issue of Food and Travel! (www.hotelzunica.it; +39 08 61 91 31 9) Daniele Zunica carries on his family’s 200-year-old tradition of showcasing only the finest local, seasonal produce at one of the best-loved restaurants in Abruzzo. This is where I had that incredible ceppe in salsa classica. (www.ristoranteclemente.it; +39 08 64 52 28 4) Seasonal, market-driven cuisine has been a winning combination for Ristorante Clemente since 1957, where it inspires a slightly different menu every day. In summertime expect plenty of fresh, colourful pastas and vegetables, and in the winter, hearty soups, legumes and game. (www.abruzzoenogastronomico.com; +39 08 64 69 12 3) A former radio DJ, gregarious Giocondo Gasbarro now channels his boundless energy into serving up some of the most mouth-watering, rib-sticking food this side of Monte Maiella, and won’t let you even think about leaving until you’ve popped a button or two. (www.villavignola.it; +39 08 73 31 00 50) Vasto’s best seafood restaurant sits a few steps away from the beach in a fragrant, secluded garden. All the seafood here is impeccable, but don’t miss the restaurant’s brodetto di pesce alla Vastese – an enormous bubbling pot of the city’s iconic fish stew. (www.ristoranteildrappo.it; +39 08 62 62 81 7) Although 32-year-old Christian Granata started his professional life as a pizza maker, he now runs one of the most popular kitchens in L’Aquila where he specialises in ‘reinventing’ traditional favourites. …And finally, if you’re interested in Manuela Cozzi’s adopt-a-sheep program, you’ll find the full details here. Be sure to tell her I sent you! Such a lovely post! I was right there with you when you were describing all that delicious Italian food. I can see why you want to live over there. what a magical place! thanks for sharing and I know you’ll follow your dream. I’ve only been to Italy once (the Piedmonte) and I’m still in love. You can write about the Mediterranean as often as you want since I don’t know when I’ll be able to return and I need something to keep my heart satisfied! So nice to find I am not the only one dreaming of going to Italy for keeps… Never been to Abruzzo though. Your lovely post makes me think I should spend my next holidays there. The strawberry gelato sounds wonderful. Your post made me want to go to Abruzzo right now! hi:I’m a new reader, and just wanted to let you know how amazing I think your blog is! so inspirational! I’m just about to move, and the kitchen is an extreme upgrade, so I’m really looking forward to trying some of your recipes. please keep writing and photoing! Wow! I was just thinking where I would be able to get a recipe for strawberry and balsamic ice cream, since there’s a new icecream parlor in Seattle called Molly Moon, which has the flavor combinations. Abruzzo is a gorgeous place – this coming from a Calabrian Australian married to a Positanese. I have various uncles from Abruzzo. One from San Donato – very picturesque village !And I have heaps of strawberries in the garden perfect for your recipe! You are making me want to get on the next flight out, everything sounds so wonderful. I can see why you would want to live there. I don’t need to have my arm twisted to get my ice cream maker out, but who (in their right mind) could resist such lusciously pink ice cream? Ah how I would love to take a vacation right about now. Also, that gelato looks fantastic! What a gorgeous photo! The gelato looks amazing! I made that gelato so that I’d have something special to nosh on during the Top Chef finale, and it was absolutely divine. Thank you so much for sharing that recipe! Melissa, always such a delight to read your posts. Gorgeous photo! Sometimes I, too, think I’m meant to be an Italian–so I get out the easel and start painting. And, man, I am no Raphael! So that’s that. I know this is a bit late to comment here, but this summer we visited the winery where Liz Franklin teaches cooking together with the lovely laura Lamaletto, Il Feuducco in Orsogna. We were invited to a wedding in Bucchianico, a small village 23 km from Pescara and had the best food ever. The last day of our visit, the couple tooks us out for a very simple but yummy meal of arrosticini.I fell in love with a Abbruzzo! Foodjunkie – How envious I am! I spent a lovely afternoon in Bucchianico, visiting Francesca di Nisio of CantinArte and her olive oil museum – did you have a chance to see it too? I also had a fascinating pasta-making lesson in the kitchen of Ristorante Ferrara. Such an enchanting place, isn’t it? Oh, how I wish I was back there! No I didn’t see the museum unfortunately. We were very busy with the wedding and the bride and groom had arranged for us a little trip around the villages where we visited an iron monger, a wood carver and the winery, so our free day was spent like that. I would love to go back too! I am so happy you have discovered Abruzzo. My parents are from there and I was lucky enough to have 2 wonderful grandmas who fed me delizie abruzzesi every week.I would suggest watching the wonderful movie Big Night. It is all about two brithers from Abruzzo. The preparation of the timballo is a masterpiece! I can smell everything you describe. Going there would be such a treat. Italy has always been my #1 country to go to in the world. Maybe, someday!!!! Your blog is wonderful – I read it all the time. Thanks!!!!!! We were fortunate to live in the Abruzzo for a year and I still miss the arrosticini, not to mention the fruits, vegetables, pasta, truffles, Adriatic, bonfires on the beach, collecting mussels off the rocks for dinner, pizza, music, people, sun rises, passagio in the piazza, etc. I’ve been trying to move back ever since. Ahhhh, the dream is still alive…. This is why I read http://www.travelerslunchbox.com. Marvelous posts.